We create custom-designed, skid-mounted pump systems to meet the highest quality and durability standards for the oil and gas industry. UMC is a leading manufacturer of pump skid systems across several industry sectors. Our licensed engineers work closely with each of our customers to provide a custom and cost-effective pump skid system that meets all requirements. 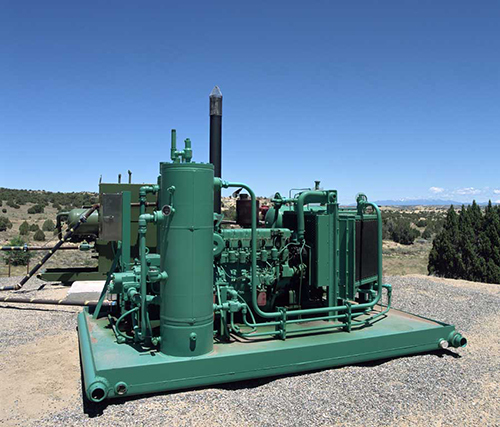 UMC also provides fully-integrated gas engine driven pump packages as well as generator / pump combination packages. Representing a very valuable option for the Midstream and E&P customer UMC can completely eliminate the need for expensive on-site rental generators by providing a gas engine / generator combination package that allows you to power your transfer pump as well as other sundry equipment including LACT’s, Compressors, or other vital equipment. Pump skid systems can be provided with complete PLC packages including touch-screen HMI controls as well as UL Listed Starter Panels, Variable Frequency Drives, or Motor Control Centers (MCC Buildings) for larger applications. We work diligently with our customer to ensure the best pump selection and technology is utilized and that all skids meet all technical and safety regulations.